The ancient custom of handfasting gave us the phrases "Tying the knot" and "The Bonds of Matrimony". You may have heard handfasting called "Celtic Marriage" or "hand-wrapping". 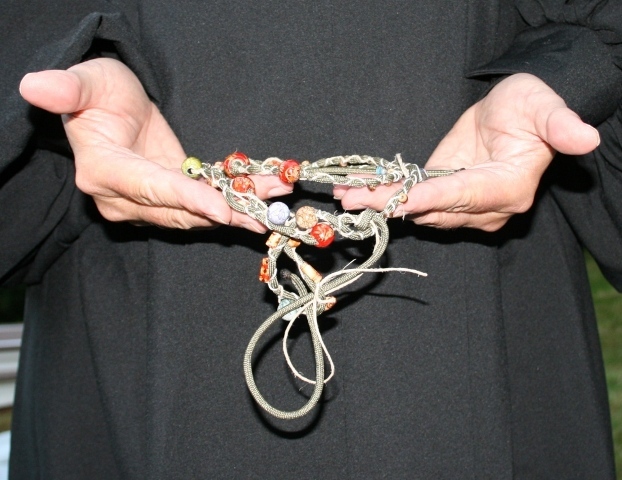 "What is the significance of handfasting?" You and your sweetheart would be symbolically bound together with cords or ribbons, whichever you prefer. You will have a unique handfasting ceremony because you will choose your own handfasting vows, your handfasting colors, and handfasting material. Some people prefer ribbons, for delicacy, while other couples prefer cords, for symbolic strength. Most people prefer to have colored ribbons or cords, with the colors having symbolic meaning. For example, gold, symbolic of wealth; white, symbolic of clean beginnings; red, symbolic of passion. No matter what handfasting colors you choose, your colors' meanings to you is the important thing. We can work together to craft exactly the symbolism that you want. There are no rules about the number of cords or ribbons that you can have (or must have) for your handfasting. People sometimes think of the Bible quotation "A three-fold cord is not easily broken." and decide to use three cords and three cord vows for their handfasting. For a three-cord handfasting colored cords are often braided: White for purity, blue for fidelity, and red for passion, for instance. You may choose to use other colors; for example, green for fertility and growth, purple for spiritual strength, and gold for wisdom. The "right colors" are the colors that are right for you. If you would like to weave beads or other objects into your handfasting, you might want to use a smaller diameter cord. Some people have used Celtic knots, elephants, shells, flowers, and Chinese double happiness charms. Rachel and Josam had an especially symbolic handfasting cord. Rachel makes beautiful jewelry with beads, hemp twine, and other material. Josam enjoyed parachuting. Together they braided hemp twine with a section of parachute cord and decorated the result with beads. Ribbons probably provide the widest range of handfasting colors. Would you rather have solid colors or ribbons with patterns? How about a handfasting ribbon with hearts? Or would you rather have all of your ribbons the same color? What about all white handfasting ribbons? If you would like your guests to tie your handfasting ribbons, you can either provide the ribbons and have your guests choose among them or ask each guest to bring a ribbon of their choice. (Please ask your guests to bring ribbons about a yard long.) If you have your guests choose their ribbon color you're sure to have a colorful ribbon bouquet! You may decide to use ribbons which match the colors you have already planned for your wedding theme. Some couples have each member of the wedding party wrap a ribbon around the couple's clasped hands. An Internet search for "color symbolism" plus the name of a specific color should provide much food for thought. The desktop version of this Page has a table of example handfasting colors and some suggested color meanings. The table is too big to present here. 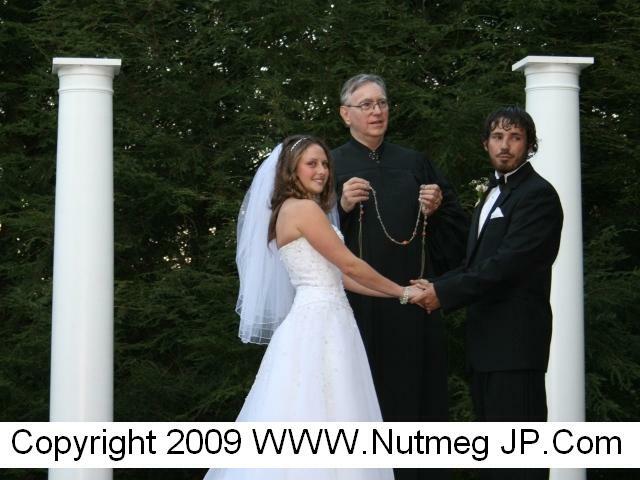 Please call me at (860) 543-2334 to discuss how your handfasting ceremony will be uniquely yours. Handfasting by itself does not constitute a legal wedding ceremony, any more than an exchange of rings would. In order to be considered legal in Connecticut, a marriage license must be obtained and the ceremony must be conducted by an authorized officiant. I would be happy to legally join you in marriage by handfasting, as long as you have obtained the required marriage license. If you would like a purely symbolic handfasting (that is, a union that is not legally binding), I would be happy to do that as well!